This is an external battery pack for the Apple iPhone 3G. 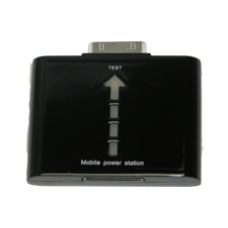 Just plug the power station into the dock connector on the bottom of your 3G iPhone and the 1000mAh Lithium-ion battery will transfer its charge to your iPhone's battery. This accessory is ideal for those who can't always take their charger with them when they go away. * Can be recharged with an iPhone Charger. * Lithium ion Battery 1000mAh. * Charge Time: approx 2.5 hours.